There is an allure to unbuilt structures: the utopian, futuristic transports; the impossibly tall skyscrapers; even the horrible highways. They all capture our imagination with what could have been. 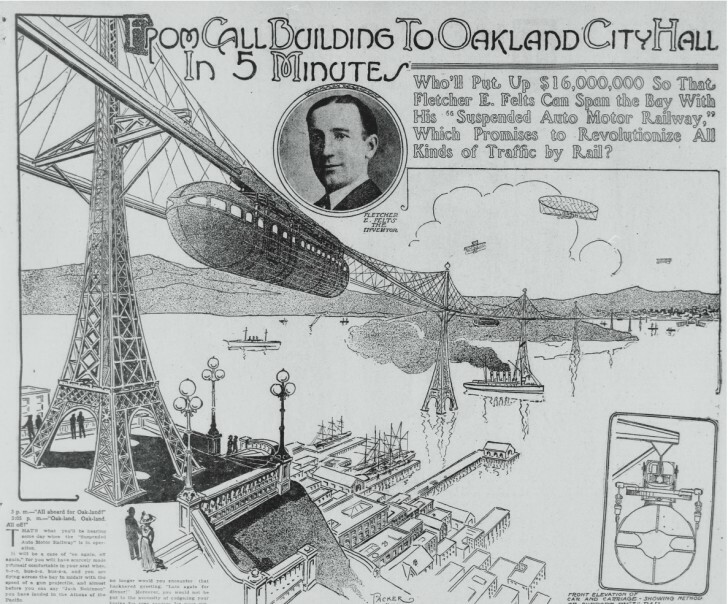 “From Call Building to Oakland City Hall in 5 Minutes” from the California Digital Newspaper Collection, Center for Bibiliographic Studies and Research, University of California, Riverside. Courtesy of The Urbanist. “It will be a case of ‘on again, off again’ for you will have scarcely made yourself comfortable in your seat when b-r-r, buz-z-z, bu-z-z-z, and you are flying across the bay in midair with the speed of a gun projectile, and almost before you can say “Jack Robinson” you have landed in the Athens of the Pacific. Fletcher E. Felts’s “Suspended Auto Motor Railway” reminds us when we used to dream big. So, too, does Daniel Burnham’s vision of a San Francisco city beautiful. Daniel Burnham Plan courtesy David Rumsey map collection. 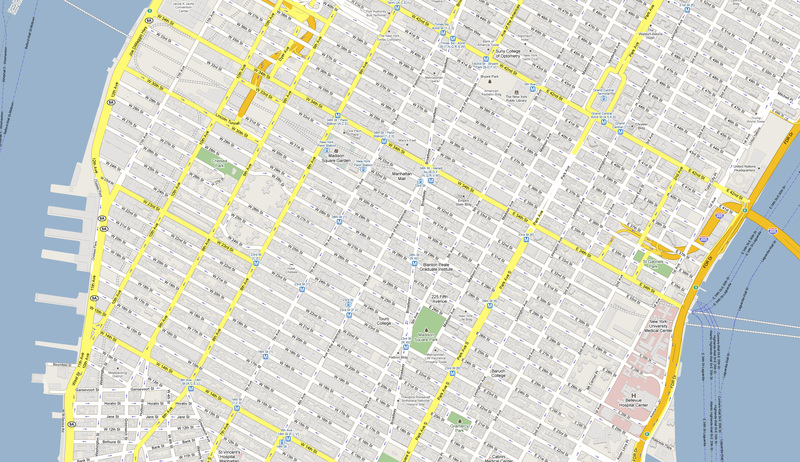 Provided to 99% Invisible courtesy of The Urbanist. Daniel Burnham was the mastermind behind the White City at the 1893 Columbian Exposition in Chicago. It was the pinnacle of “The City Beautiful” movement, with big civic centers and grand neo-classical structures to stir the soul. Burnham was hired by big-time downtown business owners of San Francisco to turn this raggedy (if well-off) city into something majestic. 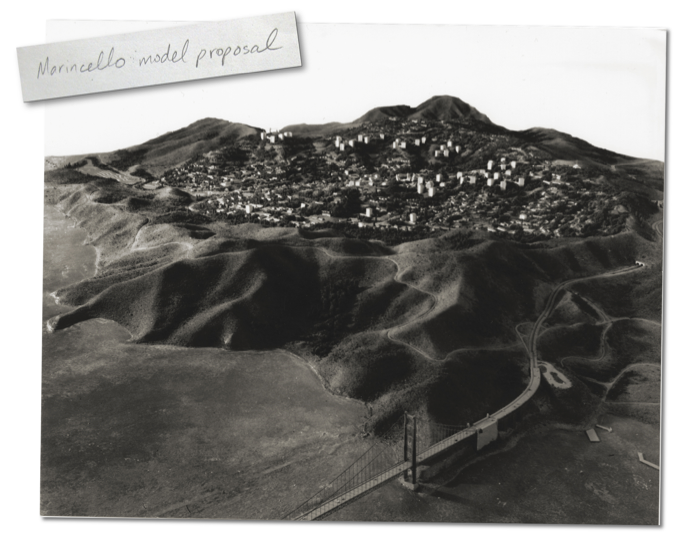 Danial Burnham’s team shows up and they set up shop in a cottage on the summit of Twin Peaks so they can survey the city and craft the perfect plan…which was completed in the fall of 1905. 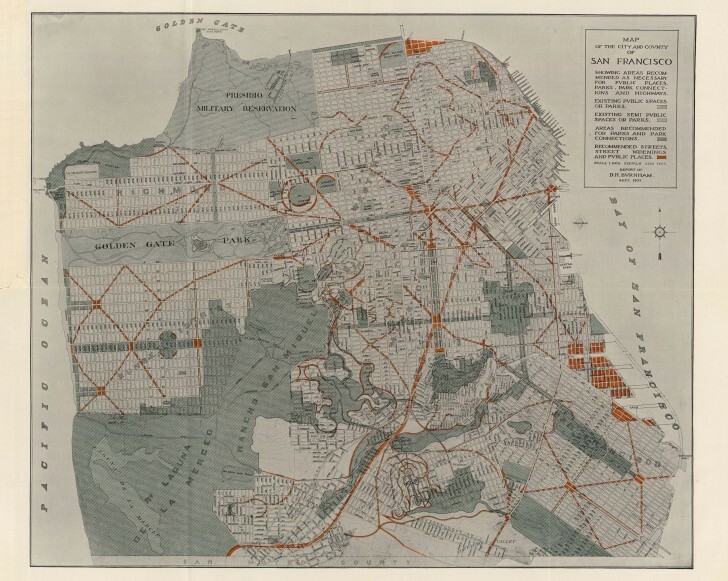 And the legend goes, all the books were delivered to city hall for distribution on April 17, 1906–the day before the great earthquake pulverized San Francisco. 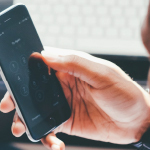 When you’re tasked with starting something over from scratch, you can use that as an opportunity to create an ideal version of what you’re rebuilding–or you can do it fast and cheap and the closest to what you remember it being like before. Tragically, San Francisco authorities went with the latter. Yet as much as we curse our forebears for their shortsightedness for not realizing Burnham’s imperial city or the gunshot funicular, we are actually a richer society in the absence of most of what never got built. And, of course the unbuilt world spans coast to coast. Case in point: Lower Manhattan, mid-20th Century. …and here’s what really is. The fake maps were created by an artist/cartographer/realtor in New York City named Andrew Lynch, who goes under the name Vanshnookenraggen. Andrew wanted to see what what New York City would look like if Robert Moses had succeeded in building two giant expressways through the densest place in the United States. 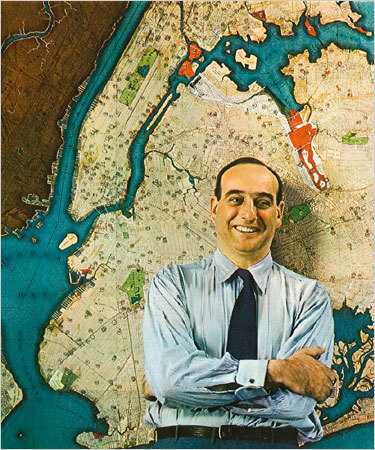 For the unacquainted, Robert Moses was the true power broker of New York. In fact, Robert Caro’s Pulitzer Prize-winning 1100-page opus about Moses is called The Power Broker. Moses built bridges, and beaches, and highways, and public housing, and he did a lot of the master planning of New York City and surroundings. He even restructured the city governance. But some of what he’s most famous — or really, infamous for — is what didn’t get built. 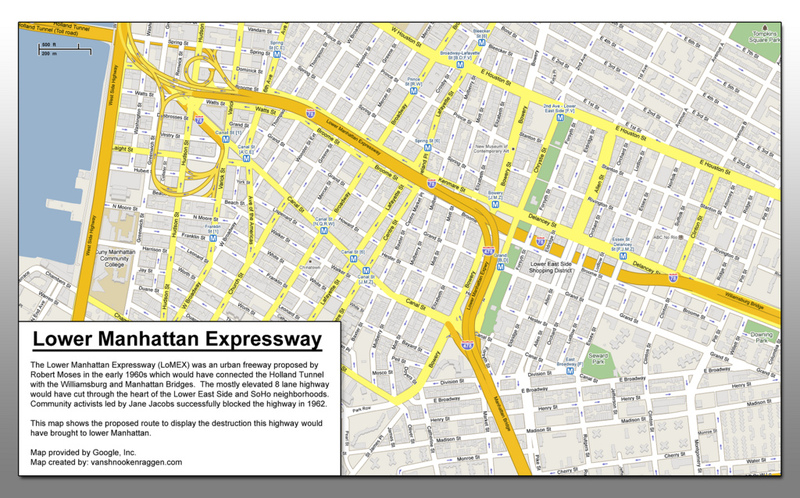 These proposed highways would have completely altered the urban fabric of New York City. Whole blocks would be leveled. 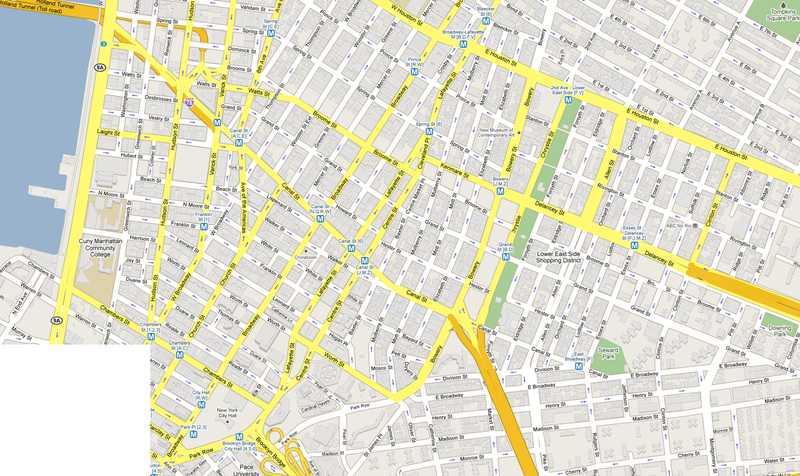 On and off ramps would wind around buildings, and make the experience of walking around Manhattan completely terrible. 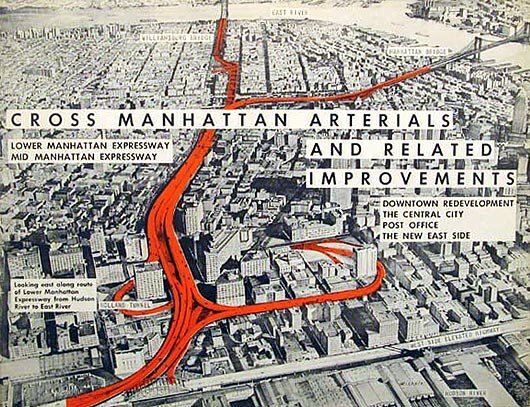 In a strange way, Moses’s Lower Manhattan Expressway helped crystallize the story of Jacobs’ neighborhood. It’s almost as if the threat from this unbuilt road made Greenwich Village into the place it now seems destined to have become. Which brings us back to the Bay Area. The Marin Headlands is a landscape of beautiful rolling hills on the north side of the Golden Gate Bridge, opposite San Francisco. It’s striking because of what isn’t there. It is a pristine recreational area a stone’s throw away from one of the most expensive cities in the world. It’s hard to believe no one tried to build on it. But, of course, someone did. From Marincello Unsoundwalk by Aaron Ximm, 2009. Courtesy of Aaron Ximm. Marincello was a massive proposed development of houses and towers that sailed through committee without too much controversy, but once the public caught wind of the plan, a group to block it sprung into action. 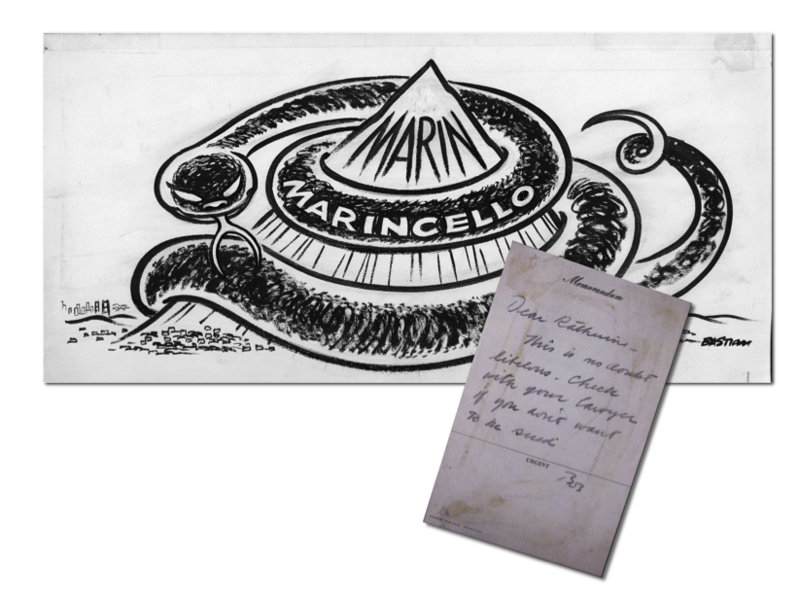 The threat from Marincello spurred the creation of the Golden Gate National Recreation Area that protects the Headlands from all future development. 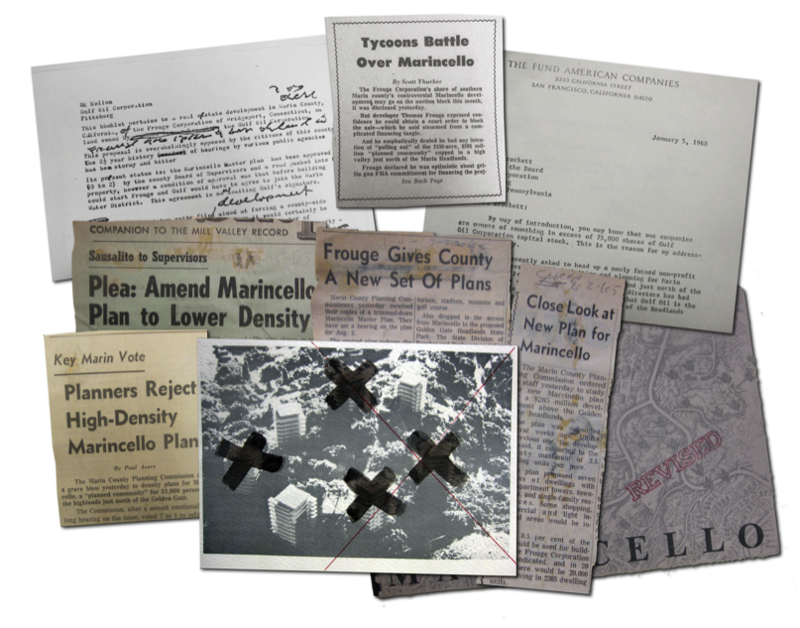 Marincello may be unbuilt, but to say that there’s nothing there in the Headlands is not seeing the grand thing San Francisco actually did build for itself and everyone who visits. What they actually built over there was a magnificent wilderness. They built the very reason we all love it here. 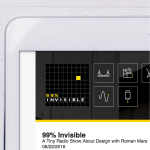 Roman spoke with Allison Arieff, Content Strategist at SPUR, which, along with AIA San Francisco, Center for Architecture + Design, Environmental Design Archives at UC Berkeley, California Historical Society, and the San Francisco Public Library curated Unbuilt San Francisco, a collaborative exhibition on view in various SF venues through November 2013. Roman also spoke with San Francisco Chronicle writer John King (whose name was invoked all the way back in Episode #2). Producer Sam Greenspan spoke about Robert Moses’s highways with Andrew Lynch (aka Vanshnookenraggen), who gave Sam a walking tour of Lower Manhattan had the highways been built. 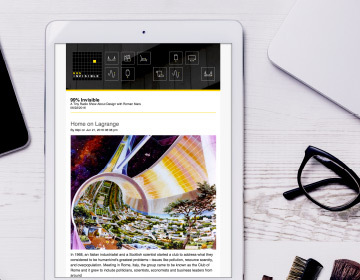 Andrew Lynch also runs Hyperreal Cartography, a Tumblr of unbuilt cities across the globe. 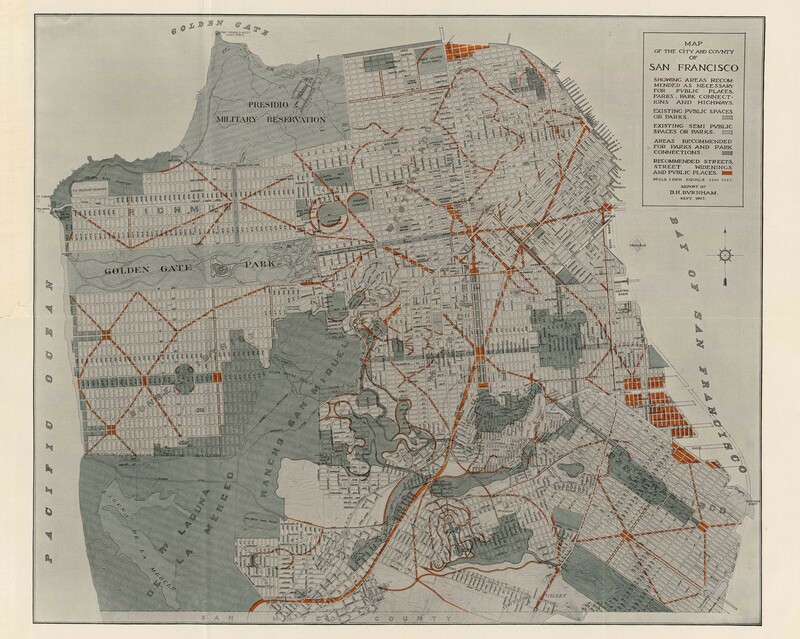 Our friend Julie Caine from KALW’s Audiograph provided the iconic sounds of San Francisco. Quiet American Aaron Ximm provided photos and documents of Marincello, which he gathered for his amazing project Marincello Unsoundwalk: A Brief Illustrated Map and Guide for Listening to What is Not Surrounding the Miwok Trail. re: building at the GoldenGateNaturalRecreationArea. Much of the area, I think around 4000 acres, north of the Golden Gate Bridge was an army reservation from the 1860s to sometime around 1990, so the idea of building a housing development there in the 1960s would have required much more than the approval of the Marin County supervisors. 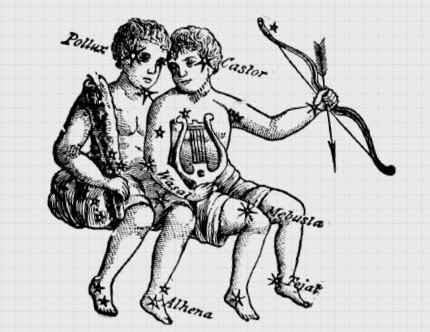 “Oh, pshaw!” you sat contemptuously – love it. The Power Broker is still my all-time favorite wonk read. At the time I was (ironically) commuting by train, and I had to cut the book itself into thirds and use a rubber band to hold the piece I was reading together. God forbid I have to carry that whole tome around with me every day. I lived in Osaka Japan for ten years. Osaka sports a pretty crazy network of flying highways, and yep: they are traffic snarls. Funny thing is that they do not seem to have spawned that awful ghetto vibe underneath them that you would get in a North American equivalent. At least I do not recall anything like that. Mostly just other, ground-level arterial roadways, or space for playgrounds out of the rain, or bicycle parking areas for subway stops, or even shops and restaurants (izakaya, etc). It’s an awesome city! One of my hometown’s Unbuilts is the Mount Hood Freeway that would have ruined the SE Portland of my upbringing. My mother is still upset that they (according to her memory) promised that reallocated transportation money to building SE Portland light rail, but didn’t fulfill that promise until 2012 with the Green extension. I wonder how that unbuilt would have changed my life! I know here in Phoenix some people wish the I-10 cutting straight through downtown was unbuilt. It’s always interesting to imagine what might have been. Re: This episode’s tiny letter plug. Have you been reading Lovecraft to that boy? I live in Richmond, a city in which the type of destructive highway discussed in this episode was actually built. Downtown, for example is surrounded on three sides by highways. Their construction leveled thousand of homes and business, blighted neighborhoods, and increased suburban sprawl. Some cities are starting to destroy these roadways and redevelop them. San Francisco’s Embarcadero is a good example. I hope this type of redevelopment is carried out in Richmond someday. It’s strange that some of the largest visions of today are merely correcting some of the largest visions of yesterday. Sometimes unbuilt things do real life damage. Haward, CA for a recent example.